Dahinda, IL: A pack of cucumber seeds, which had an ad for a local insurance agent as part of the label, and summers spent on several cousins’ Wisconsin dairy farms sprouted an interest in growing food that has not diminished. The seeds were sent to my Dad as junk mail. He gave them to me and showed me how to plant them. I was about 10 at the time and was growing up in Franklin Park, out near O’Hare. The garden that I started that year, 1975, grew in size over the years to encompass most of our back yard. My interest in growing food was bolstered by the many gardening and back-to-the-land books that were popular back then and by TV shows like Crockett’s Victory Garden. I wasn’t alone in Franklin Park in my gardening interests. Many of the homes in town were owned by Italians, Mexicans and members of other immigrant groups who also had huge gardens and each of whom had their own tastes and varieties of vegetables they liked to grow. Grown in the dark rich soil of Franklin Park were many varieties of peppers, tomatoes, tomatillos, chard, cultivated types of dandelion, and believe it or not, figs that were certainly not available at the local Kmart garden department. As my gardening experience grew I got to know many of these gardeners and they shared both their expertise and, more importantly, seeds for these vegetables that helped expand my world view. I later started a career, met my wife Julie, moved to Northbrook, and still gardened growing the varieties and the knowledge gleaned from all of the like-minded people that I met in Franklin Park. Later my wife and I moved to a 22-acre farm in Dahinda, Illinois near Galesburg. The current local food movement was ramping up and wanting to be involved, we started farming and selling our produce locally. Although we love living in Dahinda, I felt a connection to the Chicago Area and wanted a way to bring a part of it out here with me. What better way than to grow the old vegetable varieties that I grew way back in the day Franklin Park! Among these old varieties that I still grow is the Italian cucumber/melon. Extremely popular among the Italian gardeners of Franklin Park the cucumber/melon is commonly known as an “Italian cucumber.” It comes in many shapes from round to long but the most popular seems to be one that is about 4 inches long. It is covered with downy fuzz that comes off when washed. It has a mild cucumber taste and can be used in salads or can be pickled. Plant the seeds as you would any other cucumber, but I wouldn’t plant them until the soil has warmed and the temperature has been above 80 for several days. The people I knew who grew this carried the seeds over from Italy and saved them from year-to-year, however, they are available from several seed companies including Seeds from Italy. Another hometown gardening memory is tomatillos. There are many varieties and this is a commonly found item in many gardens these days. A variety highly touted by many Mexican friends in Franklin Park, is a type known as the “Mexican Strain.” This larger, heavy yielding variety is not as tart as others and makes a great salsa verde. It can also be used in other dishes like authentic chili con carne. The seed should be started indoors, 8 or so weeks before the last frost. The plants are grown similar to tomatoes but are more delicate than tomato plants. Again, my friend’s seeds were brought from Mexico and saved from year-to-year, but they are also available from Territorial Seed Company. I would be remiss in my boyhood gardening memories if I did not mention two, very Chicago, varieties of pepper. These are the Melrose And the Chicago Sport pepper. Before the O’Hare area was built up it was one of the greatest vegetable growing regions in the country. Around the turn of the 20th century, many Italian immigrants were buying farms in the Near Western Suburbs of Chicago from the German families that had originally settled the land. These new farmers began many of the truck farms that supplied South Water Market back in the day and include people like Tom Naples, who’s farm stand for many years was a fixture on North Avenue, westof Chicago. One of the peppers grown in the area was the Melrose, named after Melrose Park. It is an Italian thin-skinned type frying pepper that is great on sandwiches, in stir fries, and stuffed. I grow this variety in Dahinda from seed received from a man from Melrose Park. His grandfather bred a larger- than-normal strain and his family has saved the seed ever since. The seeds for the Melrose are available from many seed companies such as Baker Creek and the Southern Exposure Seed Exchange and the plants can be found in many Chicago area garden centers. They should be started indoors 6 to 8 weeks before the last frost and set out when the danger of frost is past. The Chicago Sport pepper is famous as the pepper used on Chicago style hot dogs. They are easily grown from plants started 6 to 8 weeks, indoors, before the last frost. 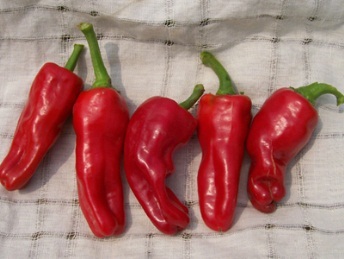 The raw peppers are somewhat hot and great used in any dish where one would like to pump up the heat. Left to ripen, they can be dried and used that way for their heat-enhancing properties. Dried sport peppers can also be ground to make pepper flakes. These can be used on pizzas and other dishes that call for dried pepper flakes. But to use them on Chicago style hot dogs they should be pickled. Once I gave some sport peppers to a neighbor who promptly put them on a hot dog, not realizing that they are much hotter when raw. She was not pleased with the results! The seeds for the sport pepper can be found through many seed companies and the plants can be found at many Chicago area garden centers. Although the seeds and plants for the vegetable varieties I mentioned above are available from many commercial sources, the best source of course, is to find a person who grows a variety handed down and saved from year-to-year. They will create a connection to the past, the community, and to the world.